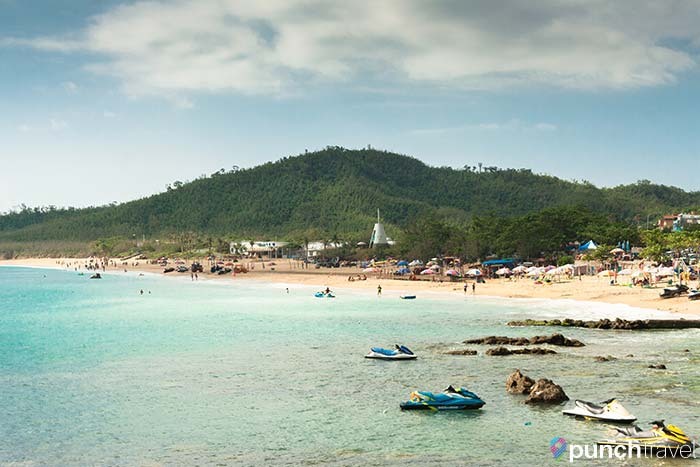 The last time I was in Kenting, the sunny beach town in Southern Taiwan, was more than 15 years ago. It was a family trip and we traveled by tour bus, stopping only briefly at each of the landmarks along the coast. I remember the beautiful landscape, the nice resort we stayed at, and oh yeah, the stray puppy. 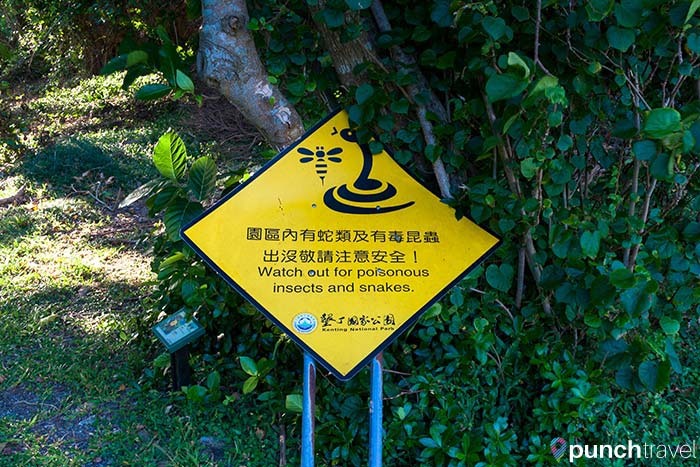 Back then, Taiwan was more run-down – dirty and filled with stray dogs, garbage, and odd odors. Visiting as a child, I was horrified to find a stray puppy on the beach, all alone and barely able to walk and fend for itself. I tried to take it with me on the bus but of course, had to leave the little guy where I found him. I was heartbroken and dismayed. This time around there were still a few stray dogs, but they seemed happier, content to be fed by the many tourists that now pass through. Taiwan’s tourism industry has since boomed. 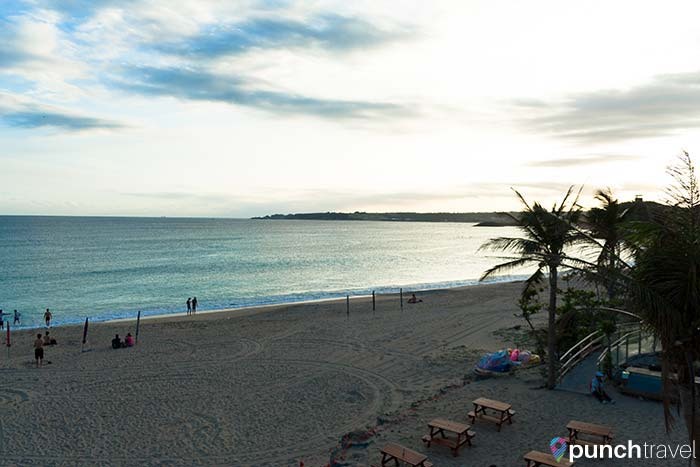 Now Kenting (also spelled Kending) is frequented by tourists from not only Taiwan, China and Southeast Asia but also tourists from the US and Europe. We visited for four days in November. The weather was warm and comfortable during the day, and cool during the evening. The area was recently battered by a typhoon, but by November the typhoon season had passed. 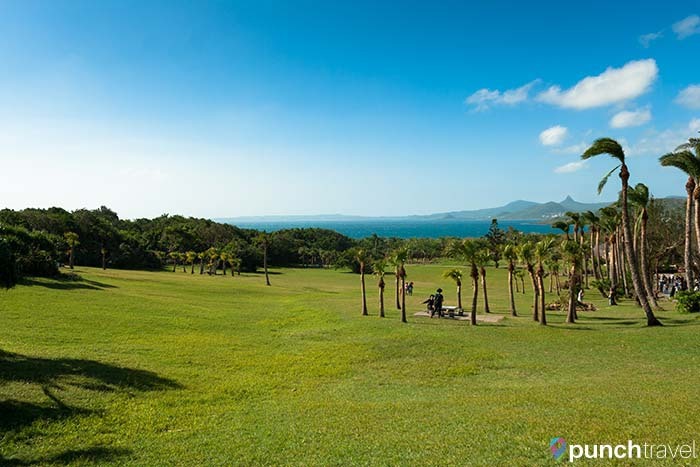 Kenting is anchored by a few large resorts, the most well-known being Chateau Beach Resort and Howard Beach Resort. But in the last few years, many small, family-owned hotels and hostels have popped up. We stayed in à boutique hotel along Kenting Main Street in Little Bay, where the evening Night Market is held. 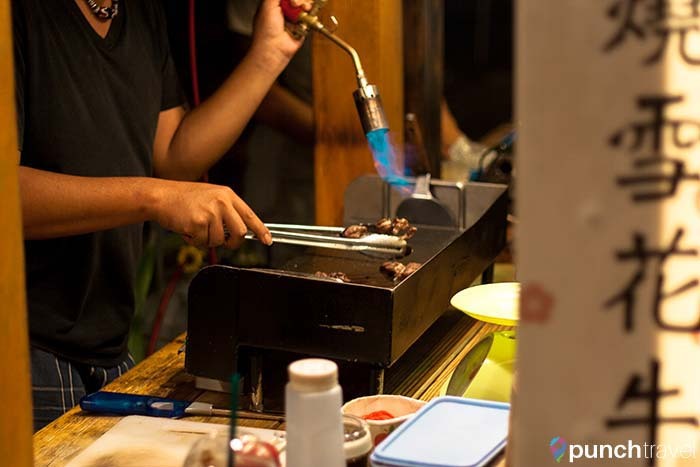 Kenting’s night market is probably one of the most popular attractions in Kenting. Spanning along the Main Street about 500 meters in either direction from our hotel, street vendors lined the streets from 6pm until 10pm. There is a cornucopia of street food to sample. There were plenty of stalls selling stinky tofu, grilled squid and corndogs. We also enjoyed trying the scallion pancakes and baked potato gratin. There was even some decent pizza to further down near Caesar Park Resort. 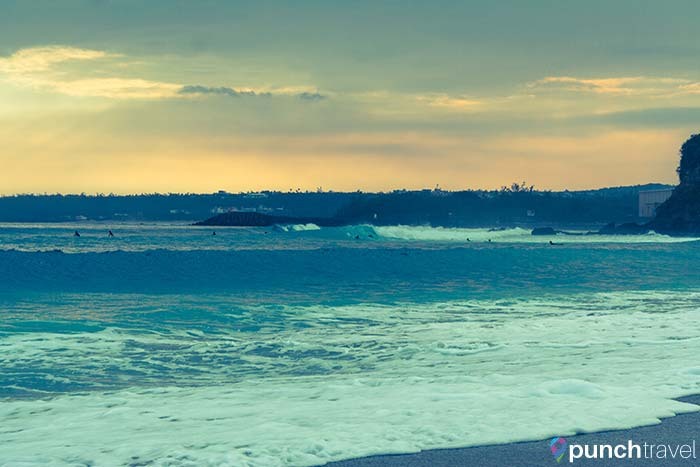 South Bay is a popular surfing destination in Southern Taiwan. 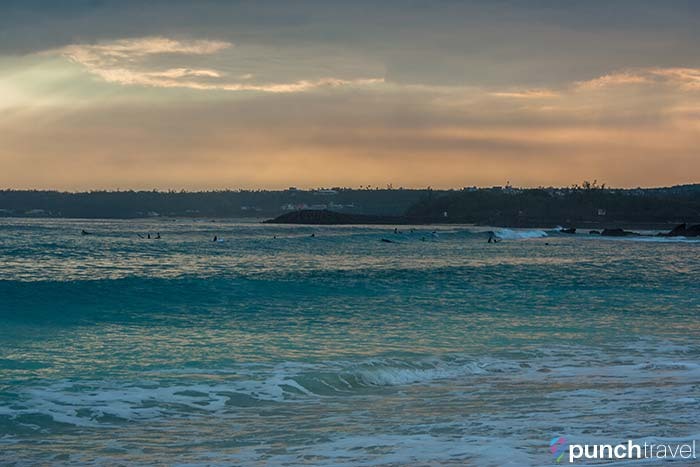 On a windy day you can see many surfers waiting for a good swell. The wide white sand beach also makes it a popular destination for sun bathers. South Bay offers also a variety of water activities, like renting a jet ski or taking a ride on the banana boat. 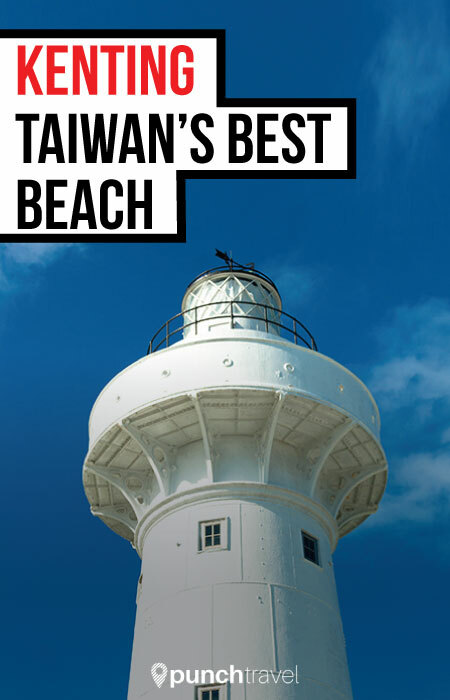 Located at the southernmost point of Taiwan, the Eluanbi Lighthouse is the only armed lighthouse in the world. 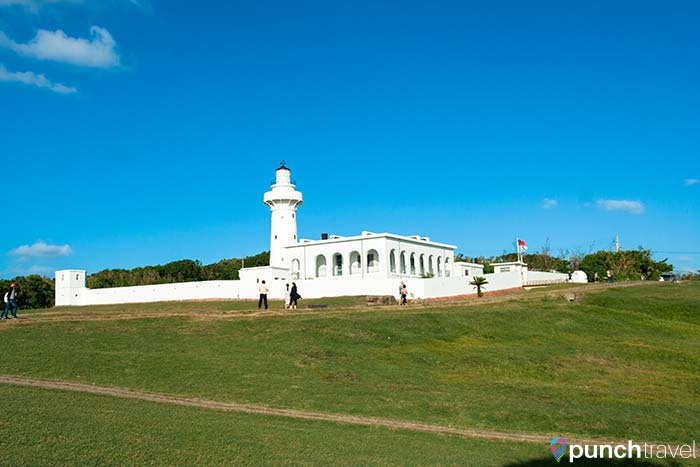 It was built in 1883 to protect it from aboriginal tribes. 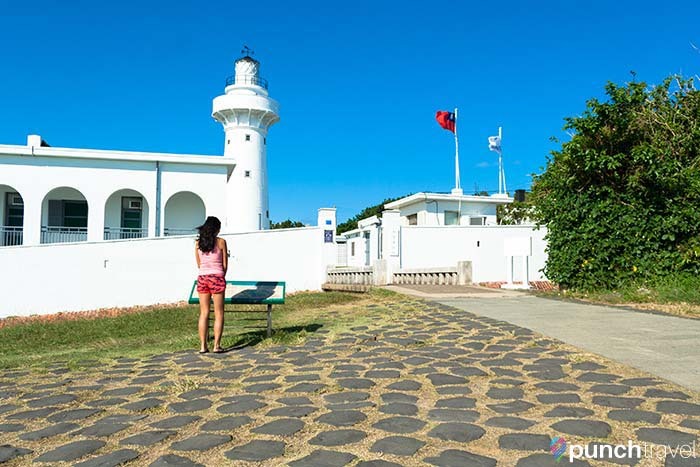 The lighthouse sits between the Pacific Ocean and the Taiwan Strait and boasts spectacular views of the sea and mountains. 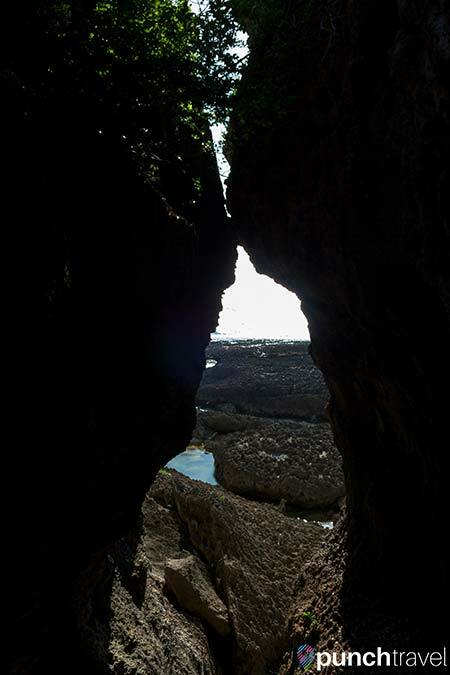 Within Eluanbi Park, there are several trails that wind through the cliffs. 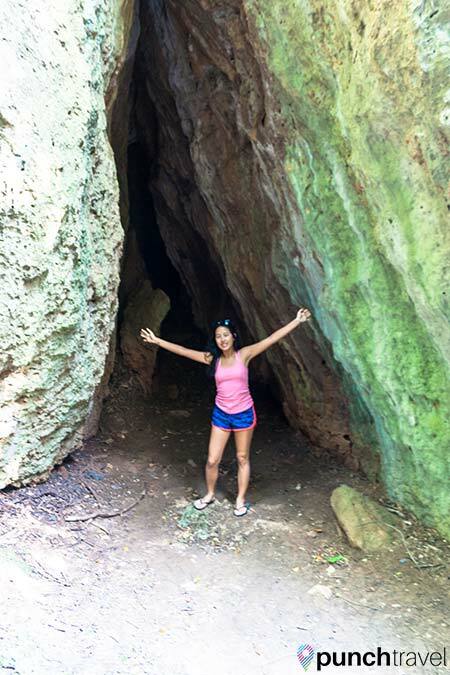 The limestone cliffs create unique formations and caves. 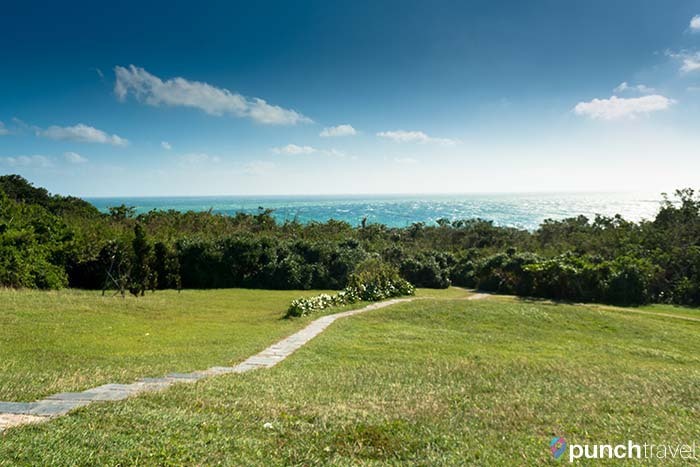 At the edge of the cliff are pavilions where you can get a peaceful view of the surroundings. The best way to get to Kenting from Taipei is by taking the High Speed Rail. From Taipei Main Station, take the HSR from Taipei to Zuoying. The ride takes about two hours. If you’ve ridden the Shinkansen in Japan, the experience is exactly the same. The seats are spacious, there are outlets available and an on-board refreshment service. 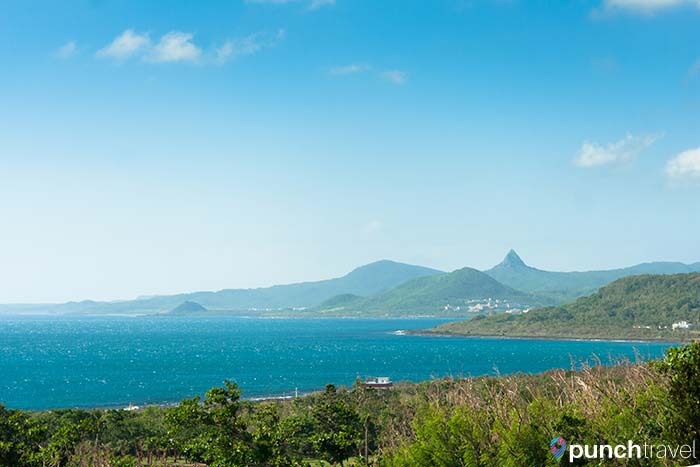 Arriving at Zuoying, we took the Kenting Express Bus direct to Kenting. The ride takes about 2 hours and costs 600 NTD round trip. You can also pay with the Easy Pass card, but you can only purchase a one-way ticket. Most tourists rent scooters to get around in Kenting. We asked around at a few places and found that prices ranged from about 400-600 NTD for the day. They have electric and classic scooters available, but electric ones are more expensive. We took the public bus to get around Kenting. There are several buses that pass up and down Kenting Main Road. The bus fare is about 20-25 NTD. Service can be both frequent and sporadic but we never had to wait more than 20 minutes for a bus. There are many bus stops along the main road and the stops are announced in English on the bus. The Easy Pass card also works here.